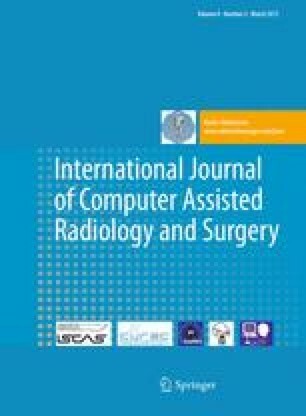 The objective of this work is to develop a preoperative reconstruction plate design system for unilateral pelvic and acetabular fracture reduction and internal fixation surgery, using computer graphics and augmented reality (AR) techniques, in order to respect the patient-specific morphology and to reduce surgical invasiveness, as well as to simplify the surgical procedure. Our AR-aided implant design and contouring system is composed of two subsystems: a semi-automatic 3D virtual fracture reduction system to establish the patient-specific anatomical model and a preoperative templating system to create the virtual and real surgical implants. Preoperative 3D CT data are taken as input. The virtual fracture reduction system exploits the symmetric nature of the skeletal system to build a “repaired” pelvis model, on which reconstruction plates are planned interactively. A lightweight AR environment is set up to allow surgeons to match the actual implants to the digital ones intuitively. The effectiveness of this system is qualitatively demonstrated with 6 clinical cases. Its reliability was assessed based on the inter-observer reproducibility of the resulting virtual implants. The implants designed with the proposed system were successfully applied to all cases through minimally invasive surgeries. After the treatments, no further complications were reported. The inter-observer variability of the virtual implant geometry is 0.63 mm on average with a standard deviation of 0.49 mm. The time required for implant creation with our system is 10 min on average. It is feasible to apply the proposed AR-aided design system for noninvasive implant contouring for unilateral fracture reduction and internal fixation surgery. It also enables a patient-specific surgical planning procedure with potentially improved efficiency.